To celebrate the release of The Daniel Gates Adventures, Vol. 2: The Lilyth Mirror and The Lucifer Gate, publisher Crossroad Press has reduced the price of The Daniel Gates Adventures, Vol. 1: The Lucifer Glass and The Leper Window for a limited time. The first volume contains the occult horror novellas The Lucifer Glass and The Leper Window, which introduce the character of Daniel Gates and are described as “utterly chilling” by Horror Underground, and “a page turner” by Brutal As Hell. — be quick, the offer ends soon! 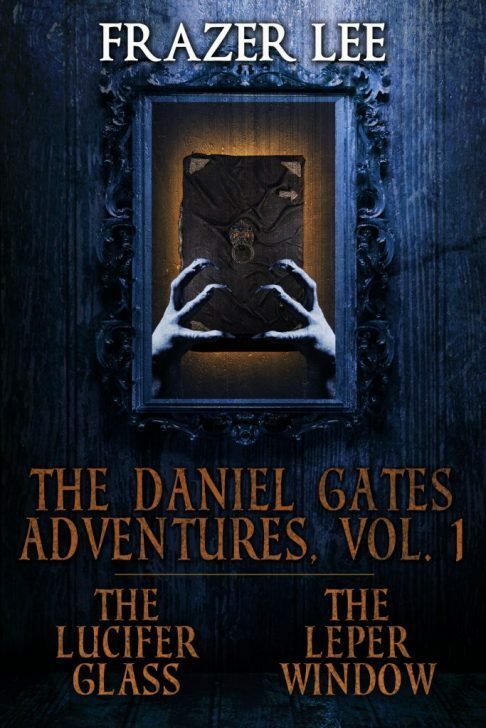 It’s March 13th ~ and ‘The Daniel Gates Adventures, Vol. 1’ is out now! It’s the 13th today, what better date for my occult horror novellas THE LUCIFER GLASS and THE LEPER WINDOW to be available in one volume from Crossroad Press? Lucky (or unlucky!) for some — depending on your perspective on weird tales of demonic grimoires and cursed artefacts. — and wherever occult tomes and evil mirrors are sold. Explore the links above to read free sample chapters in your browser, or to send them to your Kindle/e-reader/mobile device! Together in one volume, the first two novellas in the Daniel Gates Adventures. Daniel Gates is a fixer. Whatever his client wants, he can get for a price. But the price of his latest assignment is a high one indeed. He is to travel to Scotland to exchange a rare demonic text, a grimoire, for a consignment of even rarer whiskey. Reading the grimoire, Gates learns of the legend of Lucifer s Glass and the unholy trinity of green-eyed demons who protect it. As he does battle with the demons, Daniel realizes too late that there is much more to his assignment than meets the eye. He is locked in a struggle to save his very soul from damnation. Daniel Gates’s last assignment involving a rare demonic book left him plagued by hideous nightmares, which are about to get even worse. When a page is stolen from Choronzon’s Grimoire, Daniel is sent to the wilds of North Wales to retrieve it for his mysterious client. But the stolen page contains dark, occult secrets, and he finds to his peril that he is not the only one desperate to find it. Daniel’s journey takes him to the very brink of madness and to the demons that await—beyond the Leper Window. The first two novellas in my Daniel Gates Adventures occult series are back in ebook from Crossroad Press very, very soon. Check out the new cover art for The Lucifer Glass & The Leper Window – together in one volume for the first time. Released today in ebook (with a paperback edition to follow soon) The Beauty of Death Vol. 2: Death By Water is a gargantuan book of horror tales, boasting stories from Clive Barker,‎ Ramsey Campbell,‎ Caitlìn R. Kiernan,‎ Peter Straub,‎ and many more (including yours truly). About the book: In each of these stories from some of greatest writers of horror and dark fiction, water plays the dual role of accomplice and executioner. With accidental drownings, irresistible calls of sirens from the deep, strange whisperings from household plumbing, faces of the dead in droplets of water, rabid fish, leviathan monsters, and more, these thirty-nine tales of death by water will make you think twice about taking that long-awaited cruise, going for a midnight swim, or taking your next shower. Stories by: Joanna Parypinski, Lucy Taylor, Dona Fox, Eric J. Guignard, Lucy Snyder, Stephen Gregory, Daniel Braum, Simon Bestwick, Peter Straub, Lisa Mannetti, Daniele Bonfanti, Ramsey Campbell, Gregory L. Norris, Michael Bailey, Marge Simon, Caitlín R. Kiernan, Frazer Lee, Paolo Di Orazio, Dennis Etchison, John Palisano, Brian Evenson, Michael Hanson, Edward Lee, Tim Waggoner, Gene O’Neill, Jonah Buck, David J. Schow, Anthony Watson, Bruce Boston, Michael A. Arnzen, Adam Nevill, John Langan, Alessandro Manzetti, Clive Barker, Lisa Morton, Jodi Renée Lester, Jeremy Megargee, Nicola Lombardi, Adam Millard. October’s chill is well and truly upon us, and more chills are forthcoming with my new occult horror novella The Leper Window (released tomorrow, October 6th through Samhain Publishing). Click here for the full review & to add the book to your Goodreads shelf. See you tomorrow for an extract, some insights and…a giveaway! And wherever ancient demonic grimoires are sold. Horror Maiden’s Book Reviews gives The Skintaker the 5-star treatment! Thanks to all who joined me for The Skintaker book launch yesterday and made it such a success. Read the full review here – it certainly put a big smile on my face! And remember, The Skintaker is 30% off at the Samhain Store thru April.